Since I arrived in South Africa, I've been heard nothing but bad news about the situation in neighbouring Zimbabwe. I therefore had mixed feelings about a chance to see things there for myself in December. 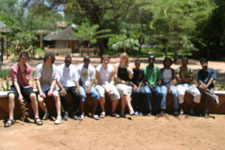 Plans for a Young Friends workcamp in Zimbabwe were mooted last Easter. I had volunteered to be on of the two 'responsible adults' to accompany them, together with Gregory Sasita-Angaluki, a third generation Quaker from western Kenya, now resident in Gabarone. I guess I had expected a few tedious formalities at border crossings to deal with, and then we could relax and reminisce about Kenya (where I was born) with the soothing sounds of other peoples' toil in the distant background. If only life were that simple! After some last-minute uncertainties about exactly how many Young Friends we were to expect, the majority of the group assembled in Johannesburg to travel to meet the others in Gabarone, across the border in Botswana. A final headcount left us with Young Friends from South Africa (3), Lesotho (2), Botswana (2), Zimbabwe (1) and three from the UK (Luton and Leighton Monthly Meeting). For a few, this was their first journey abroad. Travel to Gabarone was uneventful, and Sheldon Weeks generously put us up while we saw the local sights, and projects local Quakers are involved with. Gregory and I celebrated uhuru, Kenyan Independence Day, hearing about a fresh wave of optimism there, now that long-standing President Daniel arap Moi has finally stepped down. Zimbabwe was another matter. Just getting a bus down there was a noisy struggle, followed by an uncomfortable, tedious wait for no obvious reason. This pattern was repeated at the border (6 hours wait), journey to Bulawayo (2 hours), from Bulawayo to Hlekweni (2 hours) and again when we finally left Zimbabwe (3 hours). We finally arrived at our destination exhausted but having learnt an important lesson - nothing in Zimbabwe is straightforward. It was with surprise and relief that I recognised the Quaker star (which heads this letter) on a rusty old sign as we finally drove up a long dusty track through the bush. We had made it! Hlekweni Friends Rural Training Centre was established in 1967. Despite an impressive track record and reputation, it had recently fallen on hard times. David Jobson, a Quaker from the UK (who I knew from AVP work in Durban) has recently been appointed as coordinator, and is trying to resuscitate it. Fortunately for Hlekweni, David is also a star. It was the first time a YF workcamp had been held at Hlekweni that we knew of, and some of the problems we encountered were sadly typical of Zimbabwe today. A minibus for us to use was only fixed late on the day we needed it, after six months at the garage. We repainted a small clinic that had been built several years ago with foreign aid, but stood empty and decaying for lack of government action. The paint we used doubled in price unexpectedly the day it was to be collected, nearly wrecking our budget. While we were never threatened by them, the casual and arbitrary power wielded by the unexplained officials at frequent roadblocks was a constant, unnerving, background presence. Money had to be changed constantly, and the Zimbabwe dollar became noticeably more worthless over the course of our stay. 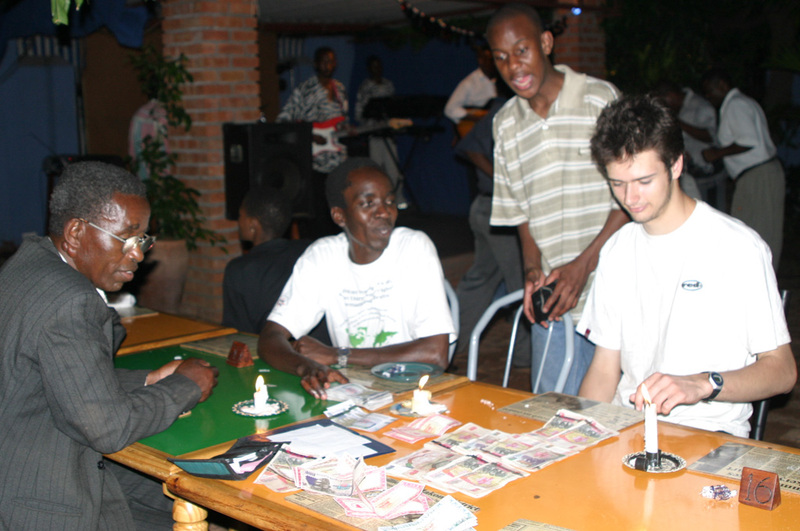 Any reasonable transaction required ridiculous quantities of notes - our one restaurant meal came to half a million Zim dollars, which spread over a large tabletop during the several recounts required to get to the right amount. Even the state-run tourist attractions no longer accept their state's own currency now, insisting on foreign exchange. I constantly struggled to understand how people made a living at all, now that Zimbabwe 'boasts' the fastest shrinking economy in the world. Despite many difficulties, we managed to clean and paint the clinic, tidy up the library, plant some fruit trees and do some other work in the gardens, and visit Victoria Falls. We learnt about recent history from several people and perspectives. Simply experiencing life in a country as it falls apart, from inflation to broken public telephones, was a thought-provoking experience for our group. The contrasts with Botswana and South Africa were quite stark. We didn't see much of how the situation in the rural areas is affecting local people. Some food we were planning to distribute, supplied by Quakers from neighbouring countries, was held up at the border. This might have been too much of a shock for our young group, from what I have heard - Zimbabwe used to supply food to the entire region, and now people there are literally starving, because of both the regional drought and the farm seizures. Yet only a few decades before, this was a country full of hope for the future. A younger Robert Mugabe had been hailed as a shining example for all, having spoken movingly about reconciliation with the white community after the end of the civil war, and at the creation of Zimbabwe from Rhodesia in 1980. His speeches of the importance of togetherness across the barriers of race and recent colonial history echoed previous, now largely forgotten, speeches at independence of others in the 60's such as Kwame Nkrumah (Ghana) and Jomo Kenyatta (Kenya). These words would in turn be echoed in turn by Mandela in South Africa, whose long walk to freedom was, in many ways, a well-trodden path. There is frustration in the region, and elsewhere, about South Africa's reticence to condemn Mugabe and modern Zimbabwe. That stems party from a sense of indebtedness, from the years of the struggle, when Zimbabwe provided a base for ANC activities. There is also a shared sense of history and grievance, as Smith's Rhodesia perfected apartheid in all but name. However shared history means shared problems, and the issue of land reform at the heart of many of Zimbabwe's problems, could also mean huge problems here in South Africa. There is always the fear of the unrest spreading, threatening hard won stability here. Much of what we saw in Zimbabwe was what I had expected through reading and talking to people. Something unexpected and new was an air of greater willingness from ordinary people to voice dissatisfaction with the government, to speak openly with us against Mugabe. The dangers of doing so should not be underestimated, but it feels like the Zimbabweans have finally had enough. Change in Kenya had also, for many years, seemed too much to even hope for. Maybe now the tide is turning in Zimbabwe as well. April 14th has been announced as the date of South Africa's general election. It will also be the tenth anniversary of democracy in this country and this is, of course, no coincidence. The ruling ANC will seek to make best use of this amazing historical backdrop to distract from more annoying current difficulties, such as AIDs, unemployment, crime, corruption, political scandals and incompetence... all the usual suspects. We already know the ANC will win again, yet this is not a sham election, and the celebrations will be genuine: South Africa has come an incredibly long way in just a decade. Is this the same cycle of hope and despair that Africa has already seen in other countries, such as Kenya and Zimbabwe? It is probably too early to say, but I personally am hopeful it is not, that it is something new. I want to share that hope with you in my next journal letter.